In fiscal year 2015, Pentagon and related spending will total $598 billion, accounting for 54 percent of all federal discretionary spending - that's the portion of the federal budget that the president requests and lawmakers determine each year in the appropriations process. 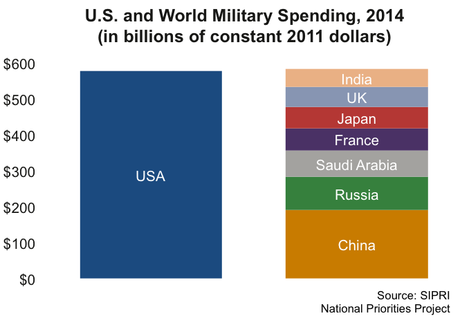 U.S. military expenditures are roughly the size of the next seven largest military budgets around the world, combined. Major Pentagon expenses include the Department of Defense, whose base budget for fiscal year 2015 is $496 billion, Overseas Contingency Operations (war funding, $64 billion), nuclear weapons and associated costs ($18 billion), international security assistance (or aid to foreign militaries, $12 billion), and other, related defense costs ($7.7 billion). A separate budget for war funding was established by President Bush after the September 11 attacks in 2001. While the Overseas Contingency Operations (OCO) budget was established in order to provide the nation with emergency funding for operations abroad, more recently it has been widely referred to as a "slush fund", because it provides the Pentagon with a relatively flexible source of funds that has been protected from legislated cuts made to all other federal discretionary spending. And while the wars in Iraq and Afghanistan have wound down, war funding in 2015 will total $64 billion, just $5 billion of which will be used on the current threat posed by the Islamic State (ISIS). As much as $30 billion of the $64 billion war fund in 2015 may be for Pentagon spending unrelated to any current conflict. 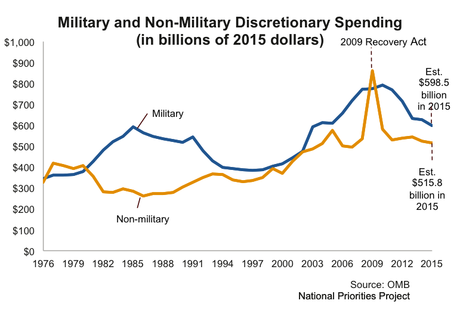 In the decade following Sept. 11, 2001, military spending increased 50 percent, adjusted for inflation. Spending on domestic discretionary programs - things like education and public transit - grew by just 13.5 percent over the same time period. The president has requested $625 billion in discretionary military spending for fiscal year 2016, which includes $534 billion for the Department of Defense base budget and $51 billion for war funding. National Priorities Project, Cost of National Security. Office of Management and Budget, 2016 President's Budget. Calculation from fiscal years 2002-2012. National Priorities Project, President's Budget in Pictures.